Miniature Bull Terriers are exactly like Bull Terriers but smaller. A small muscular dog, especially around the shoulders. This breed is distinguished by its muzzle. The head is flat on top then slopes down to the nose without stopping. Playful and obedient in a small package. Miniature Bull Terriers originated in Great Britain. Miniature Bull Terriers are 10 to 14 inches (25 to 33 cm). Miniature Bull Terriers can weigh up to 24 to 33 pounds (11 to 15 kg). 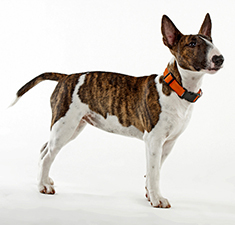 Miniature Bull Terriers may be pure white, black, brindle, red, fawn or tri-color. Miniature Bull Terriers have short thick coats and are average shedders. Miniature Bull Terriers are playful and obedient but also sometimes rough. They need firm training and are not recommended in a house with other pets. Bull Terriers are energetic and fearless and will become attached and protective of their owners. Not recommended around small children as they will not tolerate teasing. Prone to zinc deficiency, which can cause death, some Miniature Bull Terriers are born deaf. Some Miniature Bull Terriers can also suffer from obsessive compulsive behaviors, such as tail chasing. Some bloodlines are prone to slipped patella (dislocation of the kneecaps). Some male Bull Terriers have an overabundance of testosterone, this can be subdued with neutering. The life expectancy of the Miniature Bull Terrier is 10 to 12 years. Miniature Bull Terriers need ample exercise otherwise they will become lazy and overweight. When walking, Miniature Bull Terriers must be kept on a lead at all times as they will fight with other dogs. An apartment or small yard is sufficient living space for the Bull Terrier, as long as they are well exercised. Miniature Bull Terriers belong to the Terrier Group. Find Miniature Bull Terrier Puppies with our Free Breeder search!